Outdoor living spaces have grown in popularity because they are affordable, families are enjoying together-time at home instead of going out, and because of the subtle ways that furniture and lighting can really bring the homey feeling outdoors. While World Class Outdoor Lighting can't help you with the furniture part, we can certainly help you dramatically improve the ambiance in your backyard, your deck, pool or patio lighting and spotlight the beautiful aspects of your landscape investment. Remember that resort you went to last time - you sat outside at night and there were focal points to look at? Little nooks and cranies to highlight the beauty of the property. If you've made any investment in landscaping at all, you should show it off in the same way. Have a World Class Outdoor Lighting professional install your outdoor lighting - it will bring that romantic feel to your outdoor spaces and encourage more opportunities to take it outside! 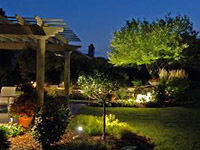 World Class Outdoor Lighting in Waukesha, Wisconsin will design an outdoor lighting scheme that is perfect for your home and for your budget! Our professional service team will install your high quality lighting fixtures on time and on budget. After the install, we will maintain your outdoor lighting with yearly maintenance - which includes whenever there is an issue with a light, a fixture, your automated system or simply that your shrubs have grown and are onstrucing the light - we will take care of it for you.